It is now a week past Halloween, and if your church did an event on Halloween day, you have either had a meeting debriefing your event or you will next week. I’m sure your event was great. You had a large turn out from the community. You were friendly and shared the love of Jesus with them. But if they don’t come back, then what? How do you effectively follow up? Halloween is the one time of the year that YOUR neighbors come to YOUR door. Or you go to their door. There is no other time that you can expect that to happen and that it is completely ok to do. We have had two new neighbors move in recently. We haven’t had a chance to introduce ourselves and honestly I don’t like going up to my neighbors doors unannounced. I don’t know why that is, but I know I’m not the only one. When my cute kids in their cute costumes rang our new neighbors door bell, you better believe I was right there to introduce myself. We exchanged pleasantries and went on our way. Now I know their names and if I ever need something or we have an event on our block, I can invite them by their name. It also gives you a chance to get to know neighbors you might not have met yet. As we were trick or treating, we got caught up with another group of kids and parents. After a couple of houses, we began interacting. Come to find out we have a mutual friend and our kids are around the same age. Another connection made simply because I was not at a church event. I know that outreach events in your community can be vital and a really great touch point to reach out to those that live in the area of your church. Halloween is the one holiday that if you want to do an event, a trunk or treat or “harvest carnival,” then do it the weekend before Halloween. Provide a fun and safe event, but don’t take away what that day could mean for those in your congregation to reach their neighbors for Christ. As with every event that you put on as a church, make sure it fits into your overarching vision and serves a purpose. 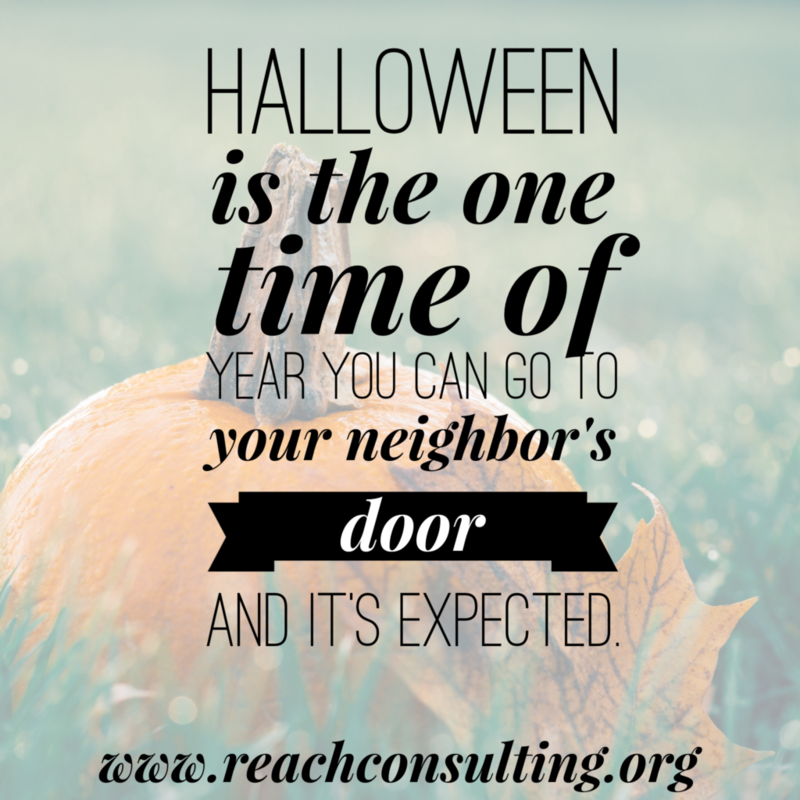 Stay tuned for Nathan’s perspective on churches putting on Halloween events and some other thoughts from Reach Consulting!